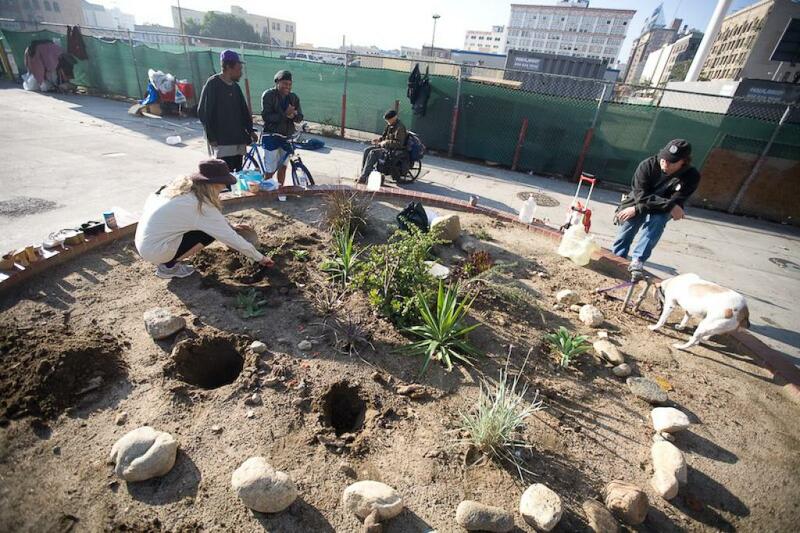 My lovely wife Penelope and our neighbor who wishes to be known as Quietearth have created a beautiful Guerilla Garden in Downtown Los Angeles. What once was an empty cylinder filled with dirt and trash is now a thriving garden filled with drought-resitant, sustainable plants. In their quest to bring more greenery to our mostly paved neighborhood, they go to the garden every few days to water. Every few weeks they plant new seedlings, cacti and succulents. The Skid Row residents who live in SROs nearby thank Quietearth and my wife every time they see them. I think the garden really cheers up both the local residents and the guerilla gardeners. I've watered the plants a few times, but my wife and Quietearth have done all the hard work. It's really inspiring to see the green, sustainable plants when I drive or walk by their garden. Penelope bends over to plant a succulent in the planter. 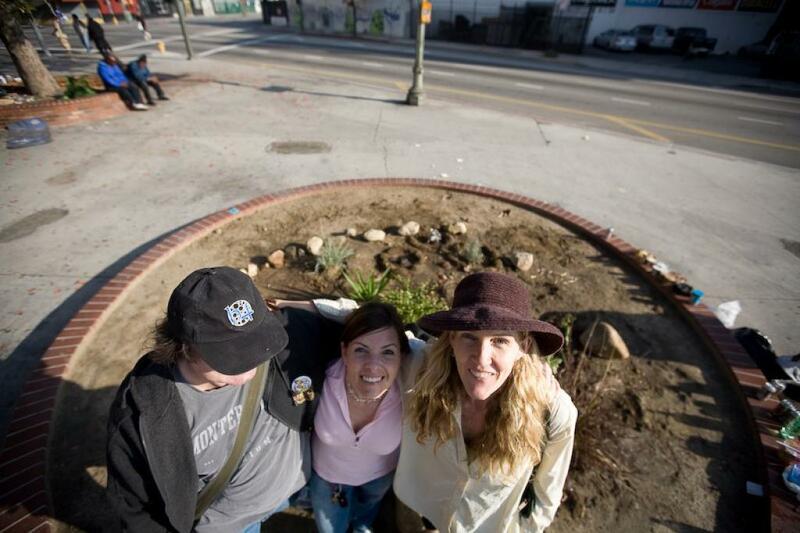 Nearby SRO residents stand around the planter while Queitearth packs dirt around a freshly planted shrub. Penelope scoops dirt around a plant she just placed in the planter. The Downtown Guerilla Gardeners stand proudly on the rim of their planter. Click here to see more photos from my Downtown Guerilla Gardening gallery.